As the experience of Strike Debt has shown, it has proven difficult to aggregate acts of defiance and default into a political force. Must Utopia go further, then: not just to erase the debts we have, but to break the economic and legal apparatuses that create debt, in order to ensure that nobody will need to go into debt ever again? 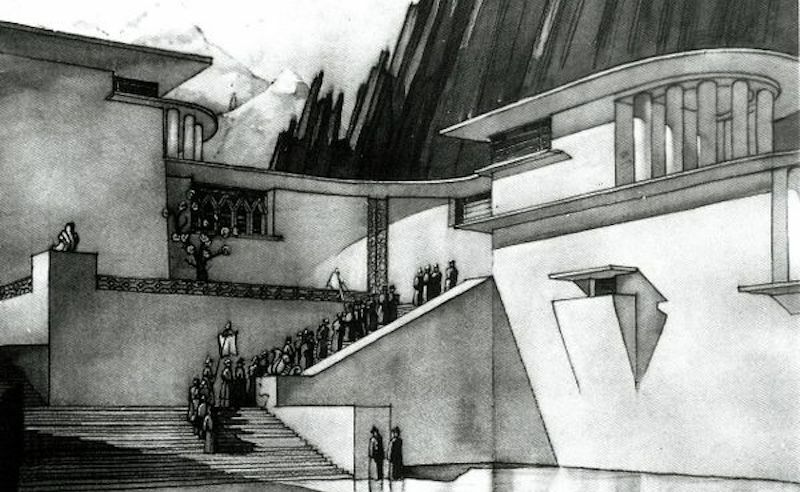 Detail from Stephen Gooson, set design for Lost Horizon (1937). This essay was first published in Politics/Letters. A full version to be published next year in a volume titled The Politics of Debt, edited by Sjoerd van Tuinen and Arjen Kleinherenbrink. Debt and Utopia? There must be some mistake. Surely all of us associate debt with dystopia, with dysfunctional economies, dead-end societies, and blocked lives. The breakdown of the social safety net drives people into personal debt as soon as they cannot afford to buy food, or receive health care, or pay for school. Consumer debt invites everyone to participate in the so-called abundance of our age, necessities and luxuries alike, but only if their credit score is high enough. Corporate debt spreads speculative risks throughout the economy, not least through the opaque dealings of the financial sector. And public debt continues to erode democratic sovereignty, discounting the common good according to the priorities and prerogatives of central bankers and bond traders. To be permanently in debt — a mixture of voluntary servitude and collective doom — seems like a basic feature of any dystopia, especially the one we are living through right now. So it might seem that the only Utopian response to the system of debt is to escape it. And yet recent history shows us that that is not so easy. There are four basic ways to do it: to pay off your debts, to refuse to pay them, to be forgiven, or to defer payment until the debts have lost their value. All of these maneuvers involve some kind of negotiation with the institutions that protect credit, and so none of them actually challenge the system of debts itself. As the experience of Strike Debt has shown, it has proven difficult to aggregate acts of defiance and default into a political force. Must Utopia go further, then: not just to erase the debts we have, but to break the economic and legal apparatuses that create debt, in order to ensure that nobody will need to go into debt ever again? Can we even imagine such a society? Is that really what we want? Here I am not going to offer a Utopian blueprint for remaking the debt economy. That’s not to say that it can’t be done. Instead I want to invoke Utopia as a method, in the sense elaborated by Fredric Jameson. In his work, Utopian thinking carries out two distinct but related tasks. First: to imagine alternative social arrangements in the form of Utopian programs: such is the great tradition of Utopian literature that extends from Thomas More up to contemporary science fiction. Second: such thinking develops the interpretive skills to detect Utopian impulses in all kinds of texts and situations, even dystopian ones, in order to show how wishes disguise themselves in order to keep their chances alive. Neither of these tasks leads to a positive blueprint for a future society: the point instead is to develop the means to understand the perpetual possibility and historical failure of all Utopian schemes, however clearly articulated or concretely realized. Utopia thus serves as a methodological skyhook or bootstrap for a dialectical deployment of that incessant wishful thinking without which social existence would be impossible. Later I will say a few things about the long history of this phrase, but for now we should ask exactly what kind of a sentence this is. Is it a statement of plain fact? A political proposal? A legal rule? A moral principle? A maxim for everyday life, or an impossible ideal? Can the sentence stand on its own — inscribed on a banner or a bumper sticker — without any further elaboration? Does it strike us as a description of a real, or a good, or a true state of affairs? Note first of all that it does not specify a place or a time for its enactment: more significantly, it does not say whose abilities and needs are being summoned. What kind of group, what kind of timetable, what kind of “us” does it call upon? Does it belong on the wall of a kindergarten? in the vows of a civil union? in the honor code of a soccer league? in the constitution of a state? in a universal declaration of human ideals? or maybe all of these, and more? Let us look closely at the relationship between the two phrases. While the back-and-forth grammar leads us to think that they mesh together neatly — as if in an equal exchange or a virtuous circle — we need to ask whether “abilities” and “needs” actually belong to the same semantic register or sphere of practice. Perhaps our abilities and our needs do not really fit together, either at the level of an individual lifetime, or the level of any conceivable social organization, let alone the level of a collective history. While the sentence seems to encourage us to think that these two processes can be coordinated, integrated, or balanced, we could just as well begin with the opposite assumption: perhaps abilities and needs speak different languages, expressing rather different dimensions of experience or existence. Perhaps this Utopian slogan expresses a necessary disarticulation rather than an inevitable equivalence. And, if so, maybe its appeal consists precisely in its promise somehow to harmonize these two otherwise incommensurable dimensions of life: abilities and needs, work and desire, giving and taking, supply and demand, private and public, or what might be called contribution and provision. In Brecht’s lexicon, “production” means something much more than “labor” [Arbeit] or economic output [Leistung]. It evokes both creativity and engagement: it drives an emphatically open-ended, even future-oriented, learning process. In this spirit, then, we could say that acting “according to one’s abilities,” does not merely deploy some individual set of skills or capacities; instead, it is the most general way of acting, the active element of acting itself, potentially unfolding along multiple lines of becoming, none fixed in advance by physical or mental characteristics. We do not just “have” abilities: we develop them or neglect them in the course of acting them out in relation to others. We do not yet know what we can do, as Deleuze keeps reminding us; the task of learning what we can do is thus the first obligation: we owe it to ourselves to be able to do more, to do better. In that way, as the Manifesto put it, “the free development of each is the condition for the free development of all” and, it must be added, vice versa. This task of “development” or “learning” fulfills without exhausting that most basic wish: to live a better life together. Adorno fears that any elaboration of the notion of needs beyond hunger will justify runaway production, consumerism, and all the plagues of the capitalist world. Is hunger, then, a pure need, distinct from all desire? Should we test all of our needs against the standard of hunger, in order to decide which ones are really necessary? This way of talking about needs seems obsolete, and not just because of the expansion in the material resources and productive forces in the decades since Adorno wrote. In fact, the debate over defining and demanding basic needs has shifted from the horizon of perpetual scarcity to the horizon of potential abundance. For the moment, my objection to the perspective of scarcity will take the Utopian path: rather than shrink our needs and demands, we should see how far we might expand them within the sphere of collective satisfaction. The key point is that such “needs” can only be conceived — and satisfied — through the acceptance of a general obligation. Our needs are active and anticipatory, driven by a force of vital persistence and perseverance, what Spinoza calls conatus. Even when they are minimal, our needs animate the full circumference of our lives, touching upon the needs of others at every point. Now then, how can these two obligations — to do what we can and to provide what we need — compose a way of life? As I have been suggesting, it is clear that the processes of contribution and provision do not “balance out” at any particular time or place, or for any particular person. (That does not mean that various economic systems have not been planned and presented *as if* such a reckoning does take place.) Instead, when pursued together, they carry out a mutual expropriation. That is to say, the ethical exercise of abilities socializes what would otherwise seem a subjective activity captured by the economic apparatus, while the political satisfaction of needs individuates what would otherwise transpire as a more or less fortuitous daily struggle to stay alive. Only by recognizing the incessantly renewed obligations that animate both processes can we hope to retrace and redesign the bonds that sustain a common life. Beyond both kinds of obligation, then, there must be something like a form of indebtedness that allows people to share their lives without appropriating each other’s possibilities. Seen in light of this task, there is finally no existential or political difference between abilities and needs; that is to say, seen from the perspective of Utopia, both belong to a complex dialectic of agency and apparatus that traverses subjective experience and collective history alike. As a provisional conclusion it would be useful to say something about the history of this formulation before and after its citation by Marx. In spite of — or more likely precisely because of — these deep resonances, Louis Blanc’s formula, as relayed by Marx, was installed in a central place in communist politics. Its most famous appearance occurs in Lenin’s State and Revolution, where it defines the ultimate stage of the revolutionary process itself. Crucially, Lenin holds it up as an as-yet-unrealizable goal, a communism that can be approached only through the less generous, less liberating rigors of socialism. Even this goal is removed by Stalin, who bluntly rewrites the dialectic into a threat, which is itself the supreme law: you must work, and you will be rewarded accordingly. This rewriting, which still seems to pass unnoticed by some of those who cite the phrase, is not at all aberrant. Instead of affirming that to each will be provided according to their need, the prevailing political attitude remains: to each his own. Indeed, “to each his own” is the great anti-Utopian phrase of our times, and it continues to inspire catastrophic deeds. The historian Perry Anderson claims that no utopian works of “wide resonance” have been produced since the mid-1970s. He links the eclipse of the tradition to the neoliberal “restoration” begun by Thatcher, with her famous anti-Utopian declaration “there is no alternative." 5 Nevertheless, Utopian works continue to be written: witness the recent appearance of Fredric Jameson’s An American Utopia, a bold and unsettling proposal to imagine how full employment, guaranteed income, universal health care, free education, and civil peace might come to the United States. (The quick answer: a “universal army” that includes everyone.) Along the same lines, the science fiction writer Kim Stanley Robinson has proposed a Utopian solution to the economic crisis and the catastrophic effects of climate change, which reads like a checklist of eminently reasonable measures that nevertheless stand no chance of being implemented in the current scheme of things: a Tobin tax on transactions, a Piketty charge on capital assets, a carbon tax, and so on. (This scenario is played out in his 2017 novel, New York 2140.) For Robinson, contrary to Jameson’s famous complaint, it is not hard at all to imagine the end of capitalism. In fact, lots of people are talking about the end of capitalism again: not just Wolfgang Streeck, but Paul Mason, Peter Frase, Nick Srnick and Alex Williams, and, a little earlier, J.K. Gibson-Graham. We would have to sort through these texts to distinguish the various kinds of end in question: disastrous or accelerationist, narrative or paradigmatic, doomed or rescued. My attempt at retracing the curves of this old saying, insisting that we try to hold on to both sides at the same time, might serve only to change the optics of the current situation. I want to propose that the sustained examination of our abilities and our needs — an exercise that can be carried out in many situations — is actually a kind of Utopian project insofar as it combines two dimensions of life that otherwise appear separate. To be able to articulate what you can do, on one hand, and what you want, on the other, combining the singular and the plural in an ongoing gesture of thought, is to grasp everyday life under the aspect of Utopia. It is a matter of learning to see a stubbornly elusive aspect of our habits, our possessions, our attachments, and our commitments, precisely insofar as such things are not really ours and do not depend entirely on us. Such scheming and such dreaming may seem at times totally unnatural and unreal, and yet such efforts remain nevertheless absolutely necessary, with or without the grander Utopian stories we might someday want to tell. 1. Karl Marx, “Critique of the Gotha Programme,” in The First International and After, ed. David Fernbach (New York: Vintage Books, 1974), p. 347. 2. Gilles Deleuze, Expressionism in Philosophy: Spinoza, trans. Martin Joughin (New York: Zone Books, 1990). 3. Bertolt Brecht, Bertolt Brecht’s Me-ti: Book of Interventions in the Flow of Things, ed. and trans. Antony Tatlow (London: Bloomsbury, 2016), p. 179. 4. Theodor Adorno, Minima Moralia, trans. E. F. N. Jephcott (London: Verso Books, 1974), p. 156. 5. Perry Anderson, “The River of Time,” New Left Review, II/26 (March/April, 2004), p. 71.